As Principal at the Balham Osteopathic Clinic, Christopher is the most experienced Osteopath in Balham with more than 15 years of treating patients, With a wealth of experience he provides a premium level of care and professionalism to clients. He specialises in neck & shoulder pain, stress & headaches, low back pain, hip & pelvic problems and pregnancy-related pain, as well as other areas. 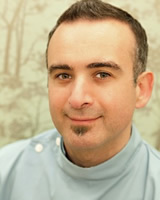 Christopher qualified from the British College of Osteopathic Medicine in 2003 with an Honours Degree in Osteopathic Medicine, a Diploma in Osteopathy and a Diploma in Naturopathy. He is also qualified to perform Western Medical Acupuncture to advanced level. Additionally, he completed the 5 year Mindfulness MSc. Degree at Bangor University in 2013. He also completed Cranial Osteopathy training levels 1, 2 and 3.